Disclaimers: 1) the pix are not excellent - apologies for that. 2) these are the steps I took - someone else doing the same designs would probably do them entirely differently - there's always "more than one way to skin a cat", as my Dad used to say! 3) explanations will be for the pix above the text. 4) Click on the pix and they will enlarge so you can see the detail a bit better. Sew - let's get started. 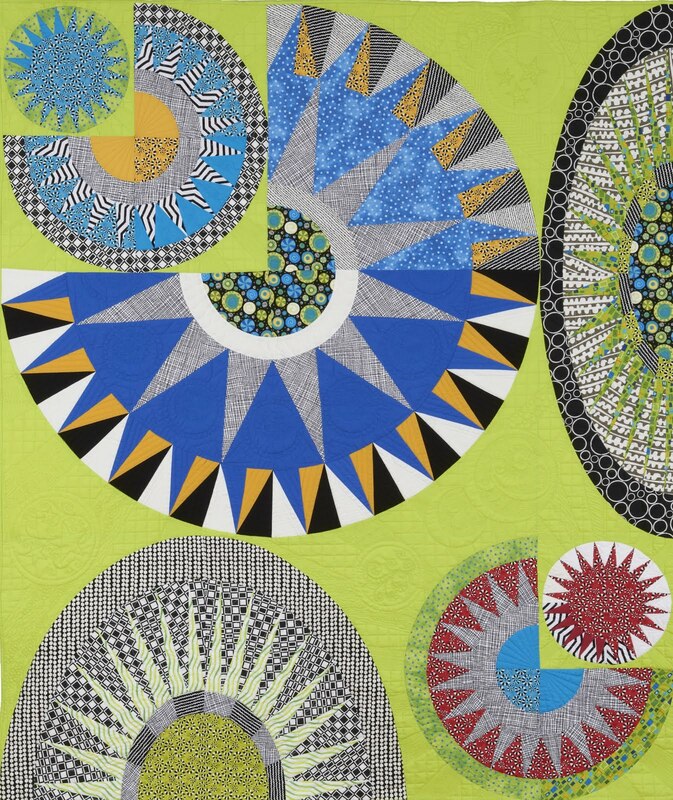 This quilt is the "Curved Nine Patch" from a book titled "A Quilter's Mixology" by Angela Pingle. I'm calling mine "Daisy Chain" for no reason other than it's the first thing that popped into my head and the design reminds me of a flower chained together. 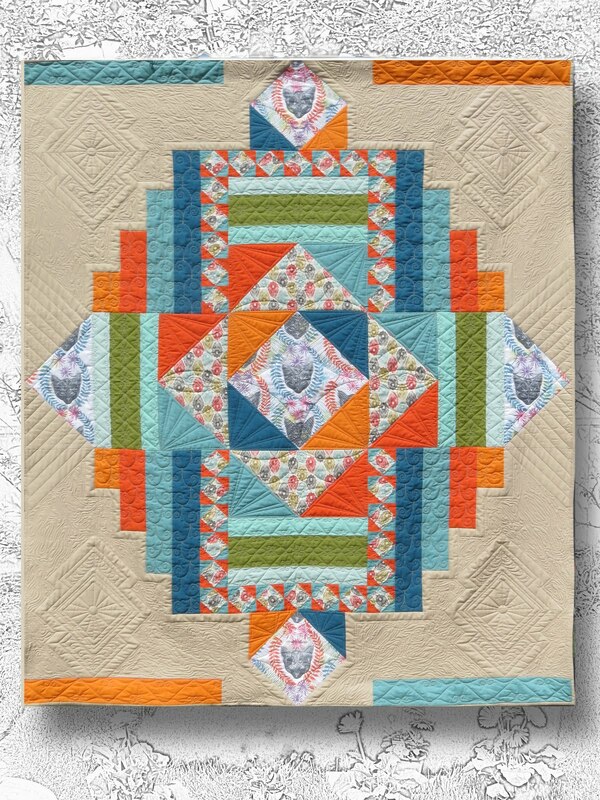 I really like this book and will probably make a few more of the quilts in it. I added an extra row to make mine 60"*72"
I try to stitch out my designs in the most efficient way, which means the fewest number of thread stop and starts. Sometimes I can figure out a really good way to do this, other times it's not so easy. But that is one of the big things I think about - try to do a design with the fewest number of stop-cut thread-reposition-start agains. How do I decide what to quilt? There are so many things that go into that decision process - fabric design, quilt design, desired end look... In this case I want to show the various design elements of the quilt, So I am going to show you how I quilted each element. I used a light grey thread - it was a toss up between pale yellow, grey or white and I settled on grey because the background prints had a lot of grey. 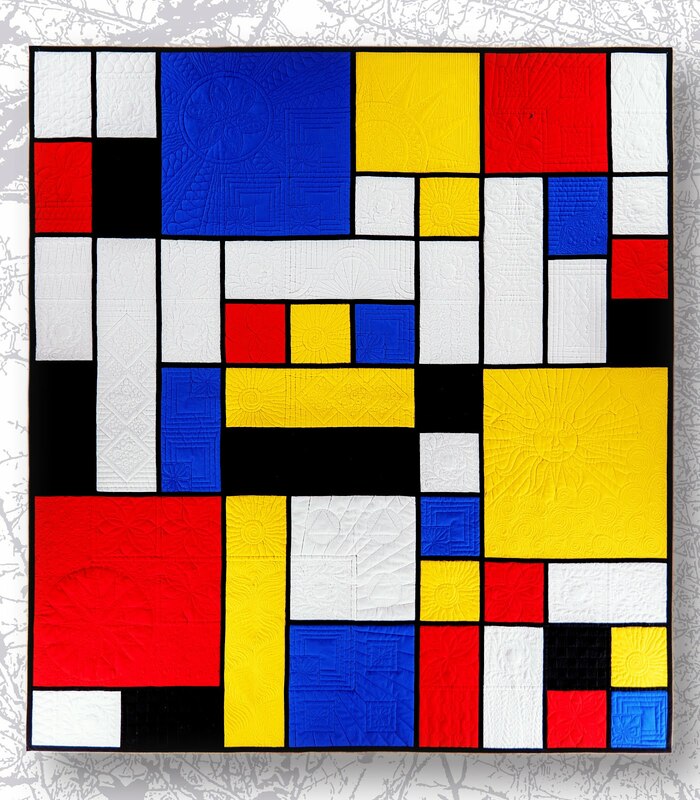 I could have used white, but decided I wanted my quilting to show a bit. Before I started the detailed quilting, which is what I'm showing in this blog post, I loaded the quilt, pin basted across the rows, baste stitched the top, bottom and sides, then went in and stitched-in-the-ditch around all the basic shape elements. So my starting point is is after I did the SID. And here it is before quilting. I wanted to "frame" it so started by marking the 1/2" lines on the straight edges using a ruler and marking pen. I prefer to use the purple air erase markers whenever possible. On this quilt I ended up using that and the blue water soluble markers because one of the fabrics would not hold the purple - it vanished almost as soon as I marked it. Mark a 6" inch square on point and then a 1/2" "frame on the inside. Result is a 5" box in the centre. Time to start stitching. I used my small Quilter's Apothecary arc and my trusty straight edge ruler made by Joe. Here we go. First reminder: remember hopping foot is 1/4" radius from needle in the centre. Rulers need to be aligned to take this into account. Needle down at starting point - I used intersection of bottom left curve and left side straight edge. Stitch the curve. Needle down at the next intersection point. Stitch the straight edge. Needle down at the next intersection point. And repeat until back to starting point. Tie off, thread to top, snip. Here is the finished "frame" around the plus sign. Needle down on the top point of the square - outside line. Stitch all the way around, then travel down to the centre of one side (doesn't matter which side - on this example I went down the top right side). Stop at centre point, on the line, needle down. Begin "feathers". As Claudia Pfeil would say - "start with a pearl" in the centre. Work out to one side making sure your feathers are between the outside and inside "frames" and stop at the square's diagonal, which is also the seam line for the block. When the space between the centre and the box corner is filled, travel back to the centre on the inner frame, then add feathers to the other side of the edge. Stop on the frame - needle down. Travel down to the centre of the next side. Stop - needle down, As before - pearl, feathers toward the finished side, travel back to centre pearl, feathers to the other side - stop on the frame, needle down. Travel to centre of next side. Repeat until all sides are feathered. A note about "travelling" or "backtracking" for new quilters. 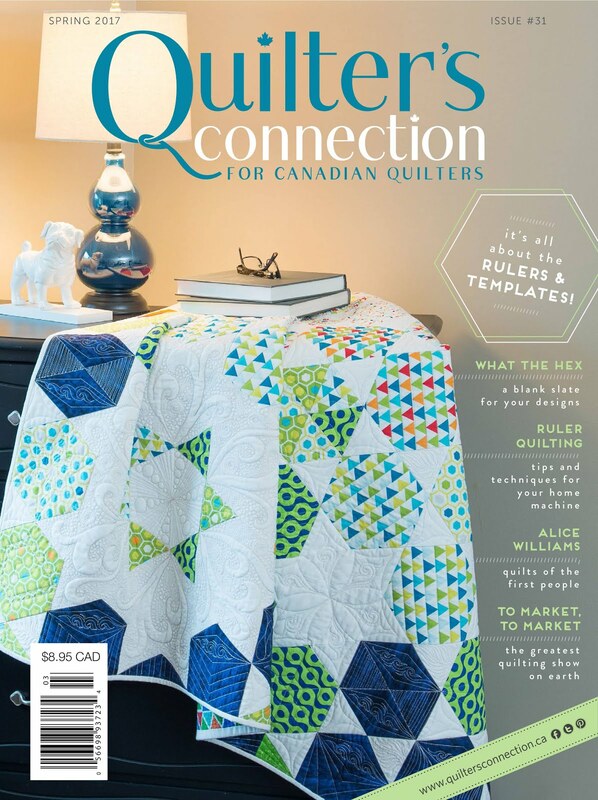 I have been told by a number of "new" quilters that they have taken free motion quilting classes where they have been told to NEVER go back on where you have quilted before. This is a BAD RULE. FORGET THIS RULE!!! The only time you should "never cross the streams" (from Ghostbusters and I always think of this when I'm meandering) is on a meander - which by definition does not cross itself. In every other kind of quilting it is perfectly acceptable to go over previous stitching. And often it is necessary to complete a design. When you have to go back or over previous stitching it is called "Travelling" or "backtracking". Perfectly acceptable and I wouldn't be able to quilt this stuff without doing that. From the corner where the feathers are finished, do a 1/2" diameter pebble into the 1/2" frame right in the corner. This gets the needle to the inside frame. Stop - needle down on the inside frame corner. On this one, I did the inside first - using two of my circle templates. A word about circle templates. I have a set that with circles in one inch increments from 2" to 12" (also from Quilter's Apothecary). I find that I can usually do what I want with one of them - just need to play a bit to get the right size. Here I started off with a 3" and 5". Starting in the corner where the pebble is set, stitch the first side of the "petal" along the diagonal to the centre of the box (using large circle). Stop - needle down on centre. Continue with stitching the large petals along the box diagonals - stops with needle down are on the diagonal at the inside frame line and then on the centre point.. Here is the circle positioned to stitch - note the ~1/4" set back from the centre point. The needle will stop right on that centre point. See! There it is - dead centre. Don't finish the first petal - that's the "back door" to get out. Switch to the small circle. Stitch the small petals on the shorter half way lines, which are the diagonal lines that were marked at the beginning. Switch back to the large circle and finish that last side of the first petal. This takes you back to the pebble and corner point. Finish pebbles between the inside and outside frame lines. Stop - needle down on inside box corner. Now travel back to the centre of the flower - use the circle to stay steady and on your first line of stitching. Add the curly things into the large petals. Et voila - the first shape element is quilted with only one stop and restart between the outside frame of the plus sign and the outside frame of the box. I used the small arc and 6" circle. Needle down in the corner. Stitch a slight curve from corner to corner using the arc. Again - remember to set the ruler in 1/4" from where the stitching line will be. Arc from corner to corner back to starting point - stop - needle down. Switch to 6" circle and stitch a slightly higher arc. All the way around to the starting point - stop - needle down. A note about circles - between the same two points, a larger circle will make a flatter arc - a smaller circle will make a higher arc. Stitch from starting corner to opposite corner across the diagonal. Using trusty straight edge - which is marked in 1/4" increments. Convenient since I want to make a 1/2" grid inside my arcs. Work down to the point by travelling down the inside arc, stitch 1/2" line, travel, stitch. About three lines will fit before hitting the corner. Travel the rest of the way down to the corner - stop - needle down. From that corner (bottom right in this case) stitch to the opposite corner on the diagonal. Travel, stitch, travel, stitch and fill it all in. There it is - finished grey square. Next up are the four adjacent blocks on the sides of the grey (or yellow) square. I decided to do a 1" cross-hatch then fill in every other 1" square with matchstick quilting. First I marked off the 1" grid. I like to mark even though I have a ruler with markings on it - I find in the long run this is faster and more accurate. However, I didn't mark on the grey square. For that, the ruler markings work well. What's the difference? Hard to explain - it's just a personal preference developed from experience. If you are trying this - try both ways - with 1) only ruler and 2) by marking first and see which one you prefer. Start at the top left - needle down. Stitch down, travel in the ditch to the next 1" increment, Up the next line, travel, down, travel up - stop, needle down in the top right corner. When I did these pix, I did the grid on all the squares by working around the grey block. Once the vertical lines are stitched, travel up one square and start with the horizontal - and no - it doesn't have to be vertical first, then horizontal - it can be the other way around. There are no rules about these things! This is just the way I happened to do it on this particular set. Also - after I did this set, I tried the next set doing one block at a time start to finish - which I found worked better than trying to go all around and do them all at the same time. If you click on the pix for an enlargement, you should be able to see that I've started to fill in the 1" squares with matchstick quilting. Slid into the square that is one over and one down from the one just filled. Continue with this until all the alternating squares are filled. A note about alternating fill. Remember to start in the same spot on each block so that the "fills" line up across the entire series. I started filling on the top left square each time. OK - now we're on to the yellow blocks. I decided to put a flower with my little curly thing. Start by marking the diagonals. Needle down in the centre. Using 3" circle, stitch the petals on the diagonals and then do the curly things. Stop back in the centre and tie off - snip - done! The ruler and marker suggest it needs marking. Yes! Mark the half way points of each curve and the diagonals (which I failed to show in this pix). ends at the marked centre point of the adjacent curved edge. Move arc to next section, stitch, stop, move ruler, stitch, stop, move, stitch, stop, move until back at the starting point - stop - needle down. 9" circle - same deal - stitch, stop, move ruler , stitch, stop, move ruler until all the way back to the starting point- stop - needle down. Now matchstich quilting under the shallow arc between the arc and the edge - all the way around. Once back at the starting point, tie off, snip thread. With 3" circle, stitch a petal (as in the yellow square) on the diagonals, then a curly thing inside each petal. Tie off, snip thread. Stitch in the two arc sets as per the yellow petal. Stop - needle down in starting corner then travel up the inside arc to the centre seam line, which should also be the center point of that arc. Once all the lines are in, travel back to one of the corners or centre points - stop, needle down. Stitch in "crazy eights" between the outside arc and the edge of the block - all the way around. If you look closely, you can see a couple of blue dots off the edge on the left. those are where the other curve centre and corner would be if they were there. I used those dots to line up the rulers - then just stitched half a design on each of these blocks. The same principle applies for the corner quarters. Done! I took a lot of pix on this because it was actually the first segment I did, but thought it should probably go last in the post. But I left the pix is as they show the ruler placements. As they say - rinse and repeat - quilting done!!!! And as a bonus, here's a shot of my front garden this morning. The sunflowers are all "volunteers". Turns out our local birds and/or squirrels are pretty good at distributing seeds! But they are pretty so we left them. Many, many thanks for your detailed explanations and photos that you shared with us! Your step by step description was fantastic. As was the designs you chose in each area Mary. How long did this quilt take to actually sew?